NexPlayer and Videon have announced support for the synchronization of OTT video arrival times for all end users, featuring interoperability between NexPlayer’s Android and iOS player SDKs, Amazon Web Services (AWS) Elemental MediaStore and Amazon CloudFront, and Videon’s edge compute encoders. Media organizations wanting to launch interactive services in order to increase audience engagement and grow their subscriber base face two major hurdles: high latency and unsynchronized video. NexPlayer is a media player for Android, iOS, smart TVs, set-top boxes, and mobile and desktop browsers, providing high-quality playback and advanced feature sets. To support low latency and synchronization with both HLS and DASH, NexPlayer has dedicated APIs to enable immediate playback upon arrival of the video segments and to manage buffer size. Other advanced features supported by NexPlayer include offline playback, Widevine DRM on all Android and iOS devices, time shifting, 360-degree video, and dynamic thumbnails. 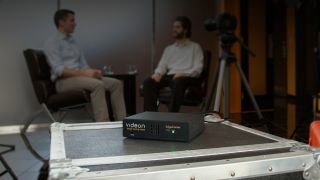 Videon’s edge compute encoder platform moves compute and time-intensive cloud processes such as transcoding, transrating, and format packaging to the edge and reduces latency by outputting HLS and DASH directly from the encoder. Extending these features to include integration with NexPlayer adds another level of capability thanks to NexPlayer’s device synchronization technology. AWS Media Services allows users to transport, prepare, process, and deliver broadcast and over-the-top video from Amazon Web Services (AWS). These pay-as-you-go services offer the video infrastructure users need to deliver great viewing experiences on multiple screens. Services supported by this workflow include AWS Elemental MediaStore and Amazon CloudFront. AWS Elemental MediaStore is an AWS storage service optimized for media. It gives users the performance, consistency, and low latency required to deliver live and on-demand video content. AWS Elemental MediaStore acts as the origin store in the user’s video workflow. Amazon CloudFront is a fast content delivery network (CDN) service that securely delivers data, videos, applications, and APIs to customers globally with low latency and high transfer speeds, all within a developer-friendly environment.